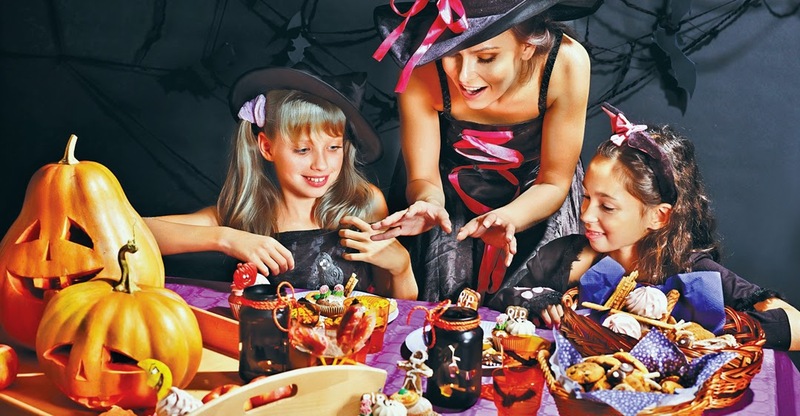 It's that time of the year again loves when we'd get all excited and creative to do a DIY Halloween costumes for our kids for the many Trick or Treat events they will be attending this coming October! If you aren't creative enough, RTW Halloween costumes are also available in department stores nationwide. 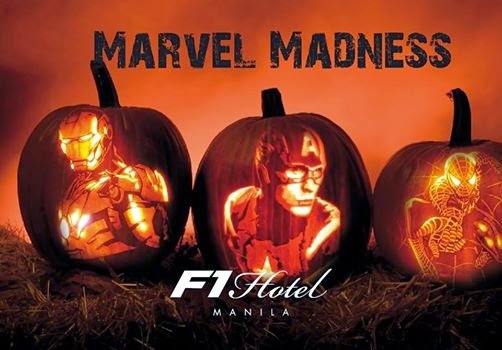 Marvel Madness, a Marvel Superhero Halloween Madness. Open to kids aged 2-7 years old only. Just present a receipt of any purchase. 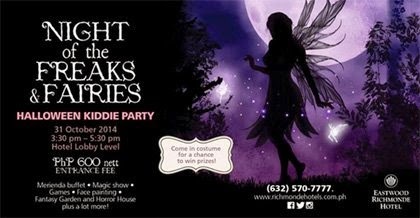 Activities: Comic book based Costume Contest, Trick or Treat plus a chance to win cash, gift certificates and Pixie Forest Party Package. Fees: A. 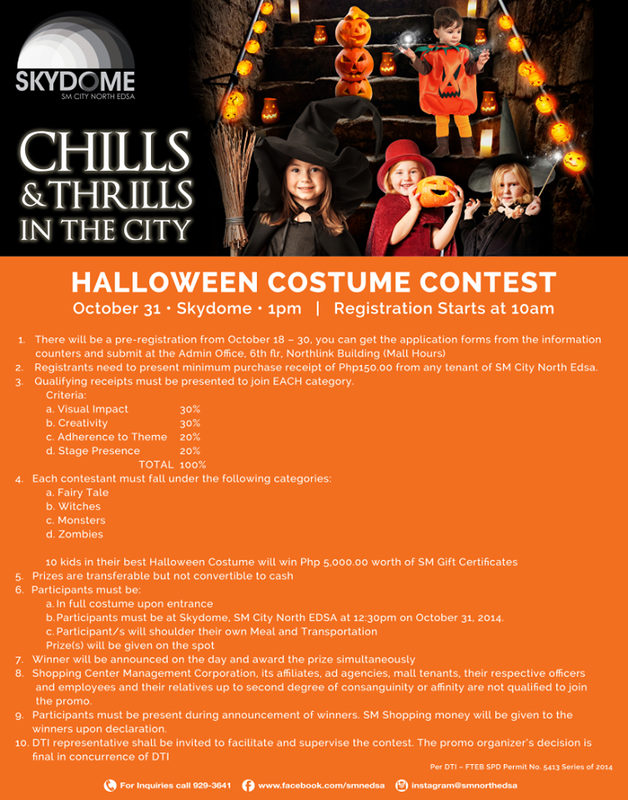 Minimum purchase of P1,000.00 single or accumulated receipt/s (maximum of 2 receipts) from any Festival Supermall tenant (receipts from bills and utilities payment excluded) from October 1 to 25, 2014 entitles one (1) child to one (1) application form. B) A purchase of P300.00 worth of ride tickets at any Amusement Center ticket booth (Pixie Forest or X-Site) from October 1 to 25, 2014, entitles one (1) child to one (1) application form. Stay at Edsa Shangri-La, Manila on days crossing over October 31, 2014. Overnight accommodation starts at Php10,071.24 net for a Garden Deluxe Room. For bookings and inquiries, call 633 8888, or email at reservations.esl@shangri-la.com. Open to kids 6 to 12 years old. 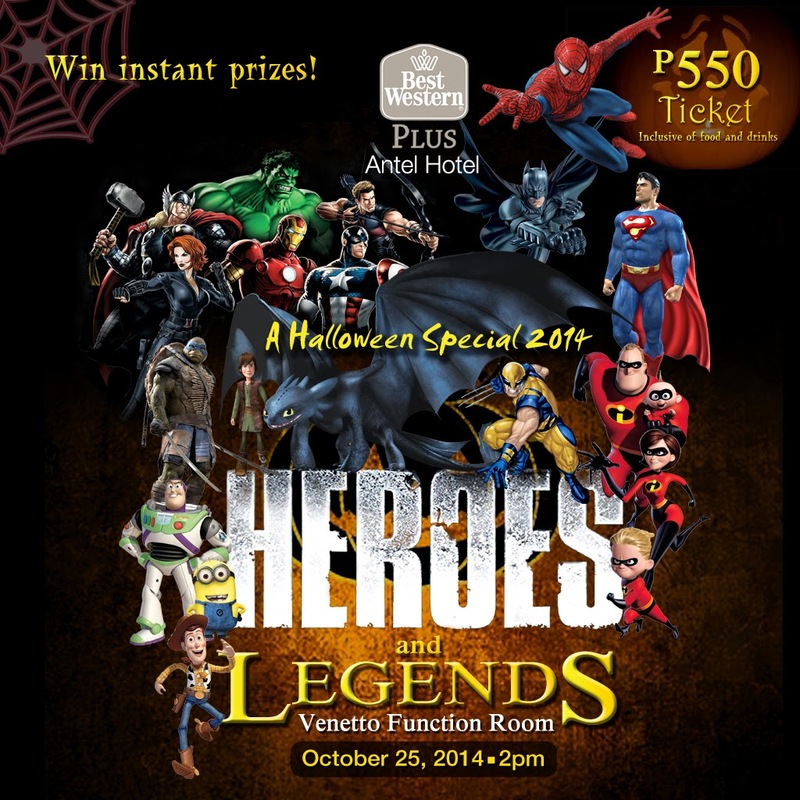 Come in your fairytale, super hero or in any wholesome character attire and get a chance to win P5,000 worth of gift certificate. Consolation prize of P500 worth of gift certificate in store for the 3 runners up. To join: Present a single receipt worth a minimum of P1,000 from October 19 to 31, 2014 at the registration counter. 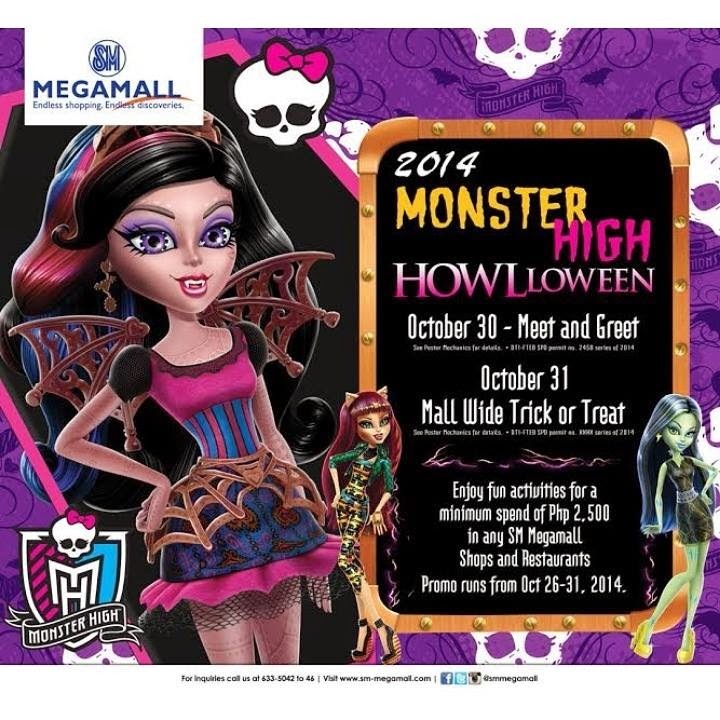 Meet and greet the Monster High characters and have a FREAKY-tastic Howl-oween with Monster High! 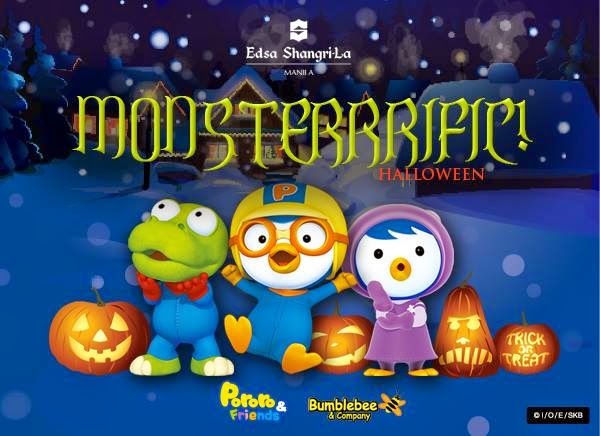 Come dressed in your freaky fabulous ghoul outfits for a fang-tastic Halloween. 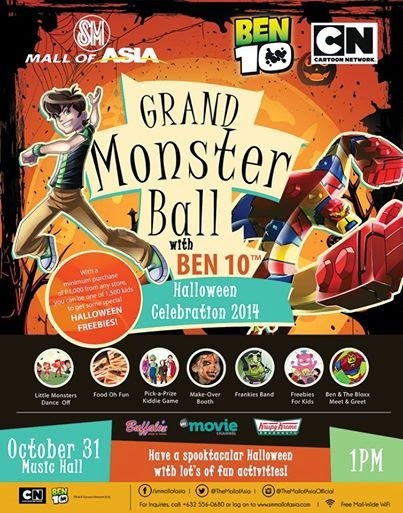 To join the Monster High Meet and Greet: Single or accumulated receipt of any regular priced Monster High item worth at least P1,500 from participating Toy Kingdom, Toy Kingdom Express and SM Department Stores from October 1 to 30, customer can avail 1 pass (good for 1 kid and 1 adult). 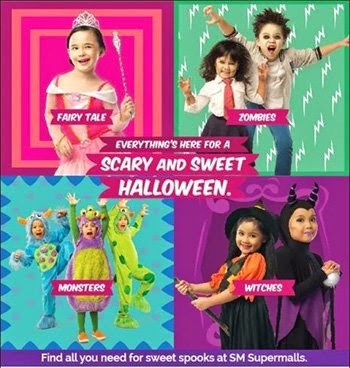 To join the Mall-wide Trick or Treat and Halloween activities: Minimum purchase of items or services worth P2,500 in any SM Megamall shops and Restaurants entitles the customer to join. 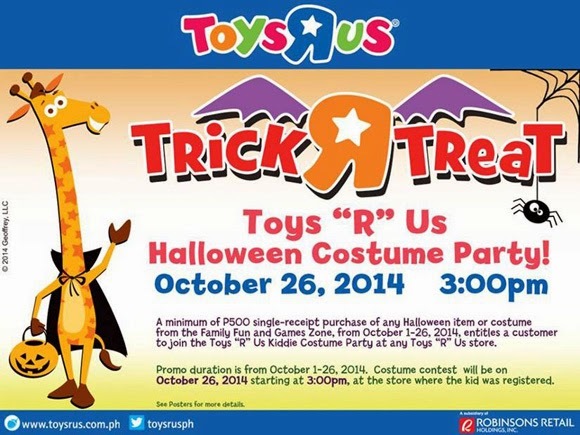 Dress up like your favorite animal characters and get freebies! 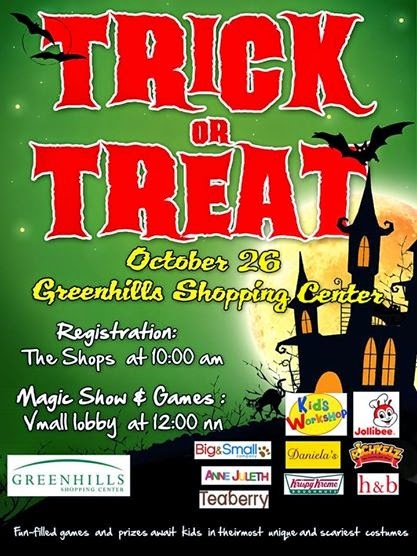 Trick or treat at the mall area, photo op with Yexel Sebastian, join the games and win prizes! For kids 4 to 12 years old. 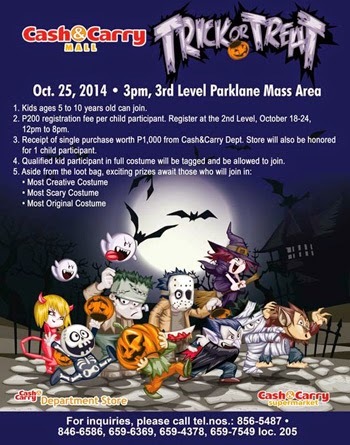 Come in your Fairy Tale, Witch, Monster or Zombie costume and get a chance to win up to P3,000 SM gift money! To join: Present receipt worth P1,000 single or accumulated purchase made in 1 day from any SM Supermall tenant. Contact number: 523-7044 loc 896. 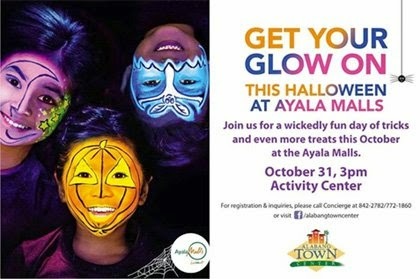 Activities: Heavy merienda buffet, creeptacular trick or treating activity, parlor games, entertainment, lootbags and raffle prizes await the kids and the whole family! 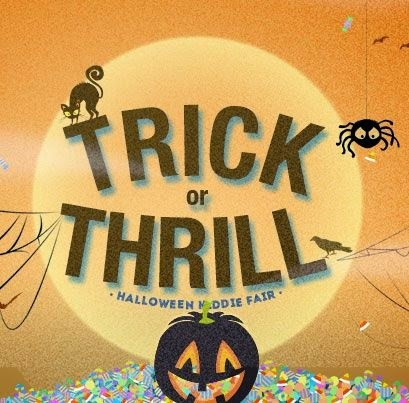 Giant inflatable game, Halloween treat stop station, Lazer Xtreme games, mall-wide Trick or Treat. To join: The first five hundred (500) customers to register may join. Present a minimum of P1,000 worth of single/accumulated receipt/s dated October 30 & 31, 2014 from any Alabang Town Center establishment (except telecom lane) at the Concierge. A customer is entitled to one (1) Halloween Passport. 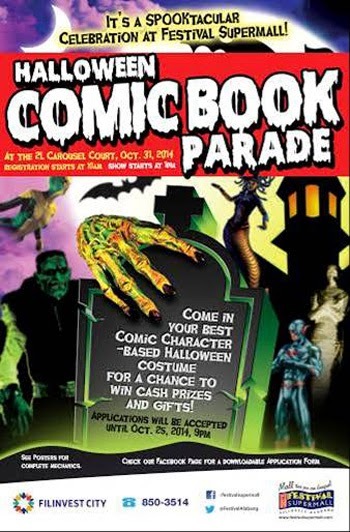 Registration and redemption period is on October 31, 2014 from 10am to 3pm at the Concierge. 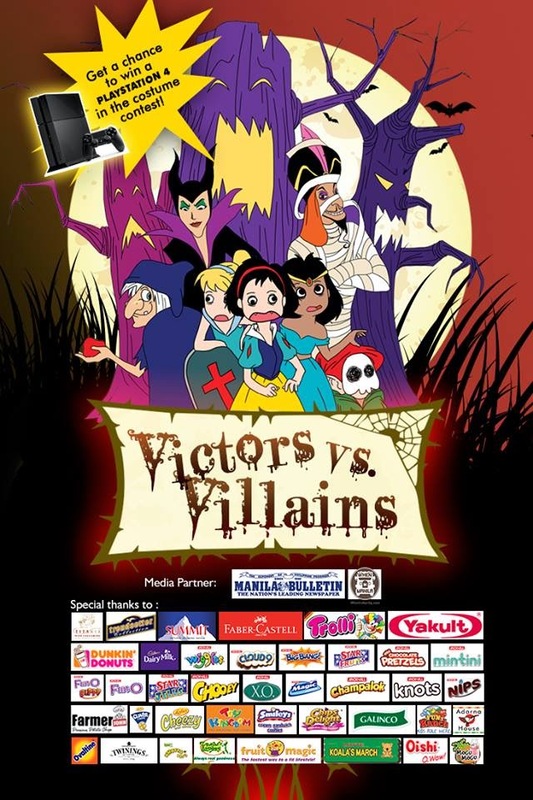 Kids will surely enjoy the lootbags, magic show, face painting, glitter tattoo, photo booth and fun games! 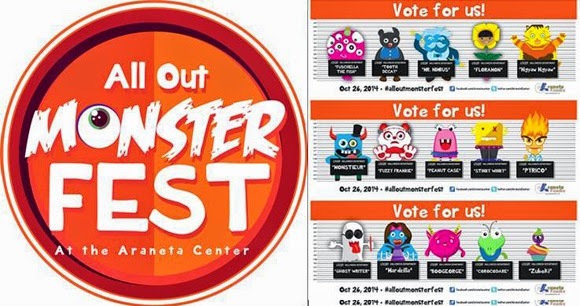 Activities: Little Monsters Dance Off, Pick A Prize Kiddie Game, Make-over Booth, Food Stalls, Meet & Greet and Freebies for kids! 50% off on Ride-All-You-Can tickets for kids in costume (kids 12 years old and below) present child’s ID for verification. Special show by guest entertainers. Like them on Facebook for more info. From October 25 to November 2; date and time may vary per store. 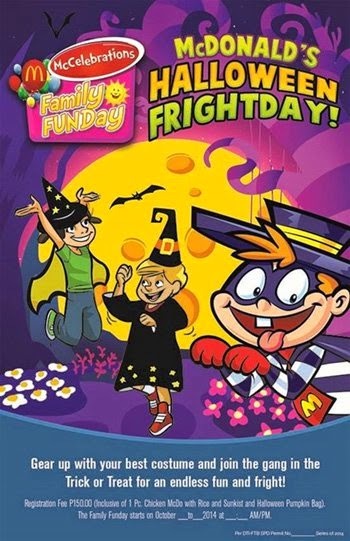 A fun-filled day of halloween games, showcasing of costume/in-store parade, good eats and McDonald Land character apperance. 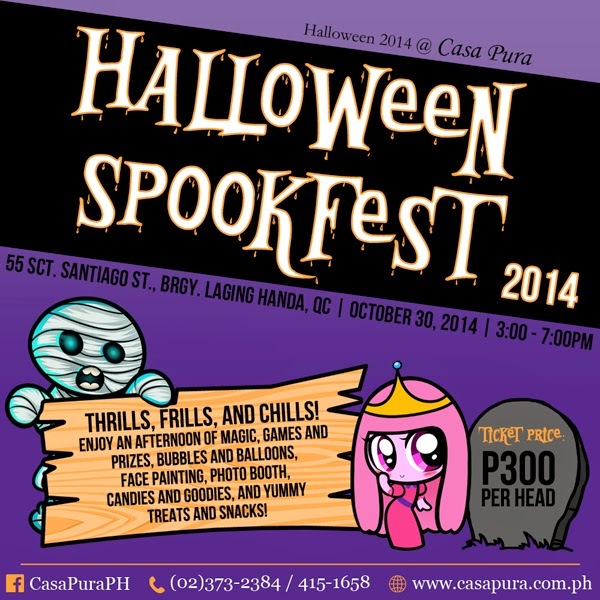 Ticket Price: PhP 150 inclusive of 1pc Chicken McDo with rice and Sunkist, and a Halloween pumpkin bag. For more information you may visit any McDonald's branch near you and visit their website for more details! 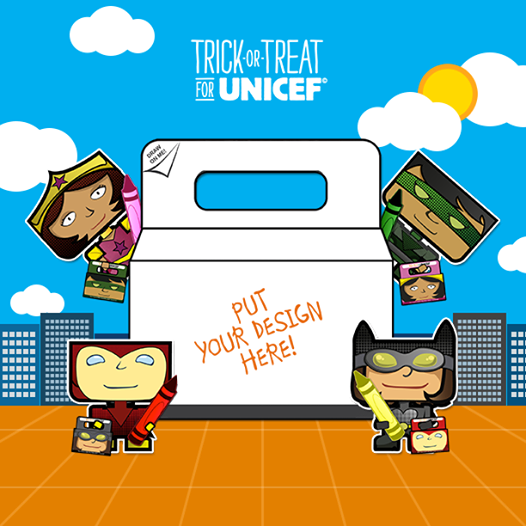 Create-Your-Own-Superhero contest from October 4 to 26, 2014. Super cool prizes are waiting for you at the finish line! More updates on their Facebook page. 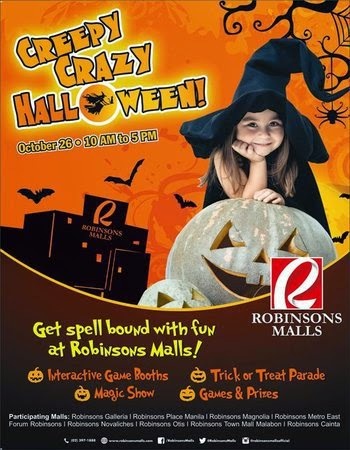 Requirement To Join: Minimum purchase of P500 single receipt of any Halloween item or costume from the Family Fun and Games Zone from October 1 - 26. 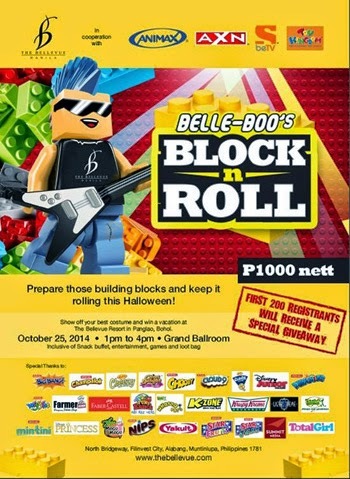 Open to Resorts World Manila members’ children ages four to twelve years old. Members must present a single receipt purchase worth at least PHP2,500 from participating outlets for a chance to get one (1) free event pass. 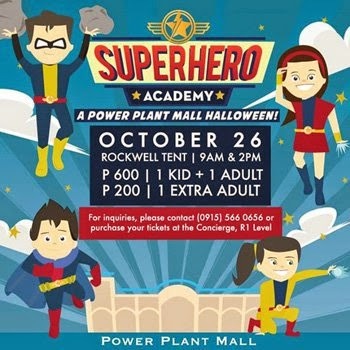 Activities: Games and prizes await kids in their most unique and scariest costumes. For more info call them at 721-0572 or like them on Facebook. 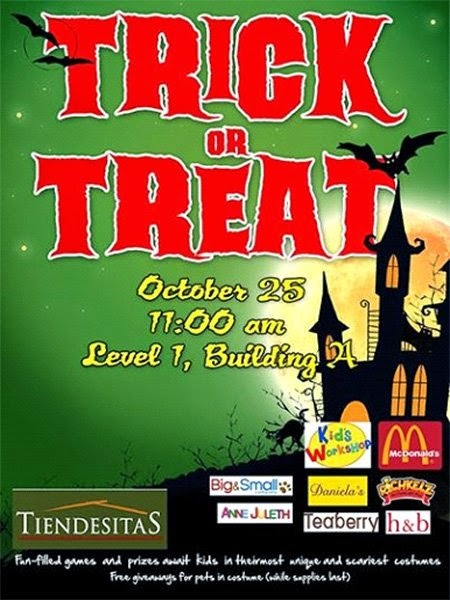 Activities: Treats and prizes await the attendees coming from our various sponsors and partners PLUS a "trick-or-treat" at the participating outlets of A.Venue Mall. For more information and ticket reservations call (632) 773-3000 / 662-3300 / 403-0808 / 403-0888 or e-mail reservations@antelhotel.com. You may also visit their website for more details. 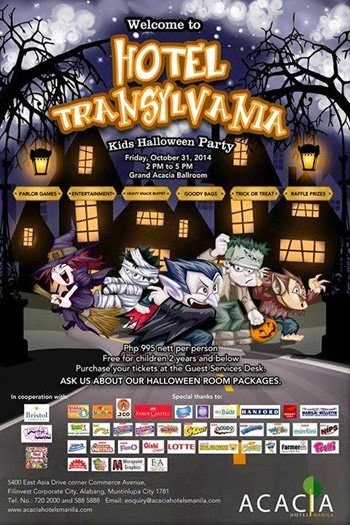 Tickets are available at PhP750.00 NET at the Concierge for every young trick-or-treater. 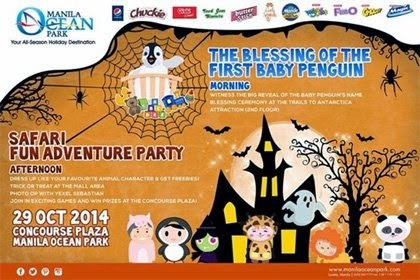 Activities: Costume contest (for kids between 0 - 12 yo only), games and exciting prizes. 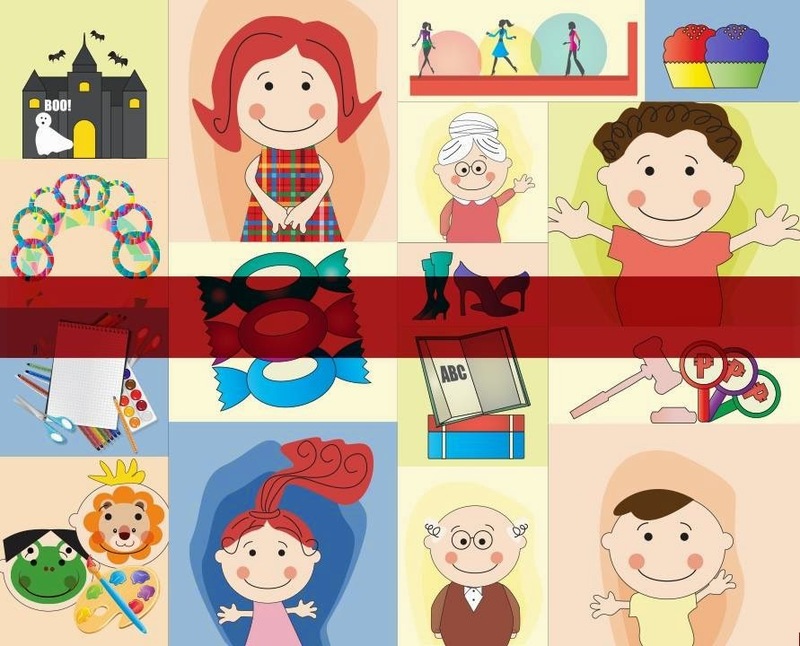 Activities: Magic show, balloon twisting, games and face painting. 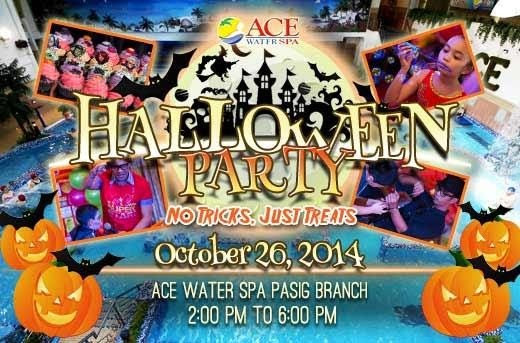 For more info, visit Ace Hotel Suites Facebook page. 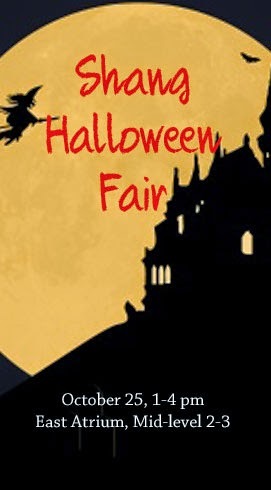 Activities: magic show, face painting, storytelling, mascot appearances, costume contest and trick or treat. Activities: Snack buffet, entertainment, games and lootbags. 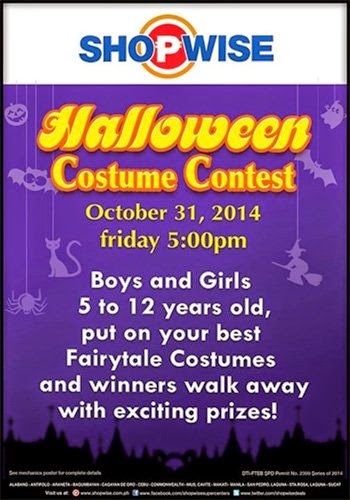 Come in your best costume and get a chance to win a vacation at The Bellevue Resort in Panglao, Bohol. 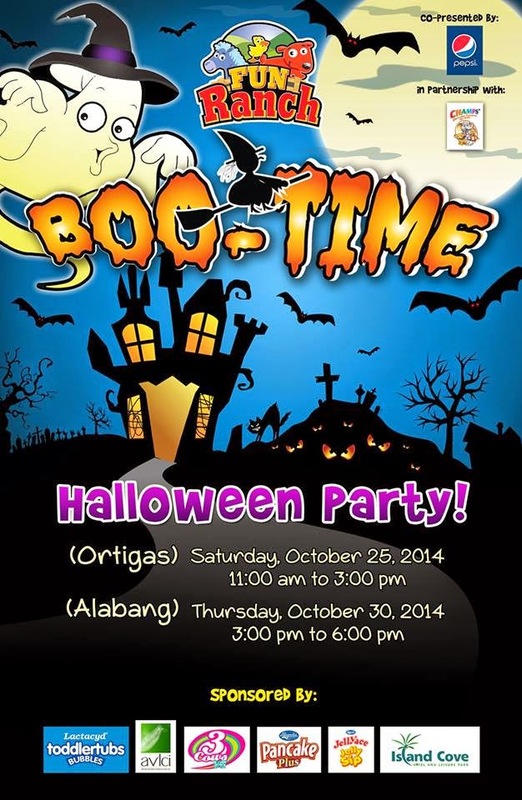 Activities: Loot bags and Trick or Treat parade await kids in costume! Ticket price: FREE, slots are limited so register early! 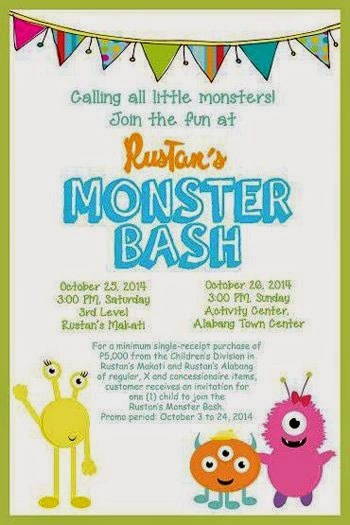 For a minimum single-receipt purchase of P 5,000.00 from the Children’s Division in Rustan’s Makati or Alabang from October 3 to 24, 2014, customer receives an invitation for one (1) child. 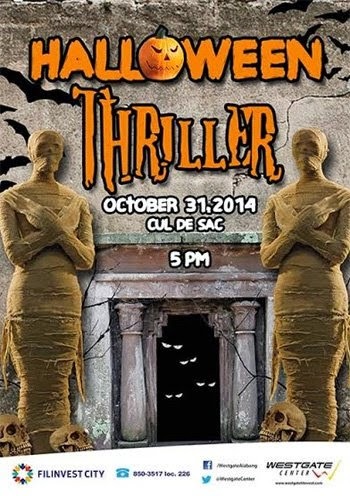 Activities: Come in Halloween Costume, games, arts and crafts, cookie making and decorating, and trick or treating! 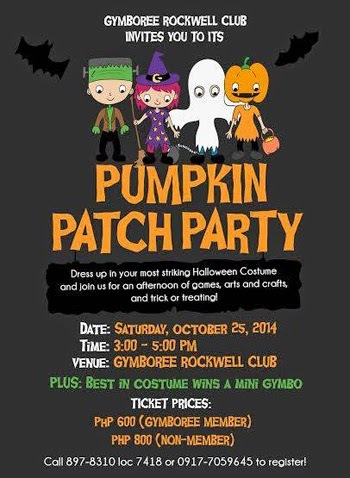 Win a mini Gymbo if you win "Best in Costume"! To join, customer must present a single-purchase receipt worth at least P500 from any of the participating mall's retail outlets and must register their child, aged 4-12 years old, at the Customer Service counters within the promo period. For more info, visit their website www.robonsonsmalls.com or like them on Facebook. 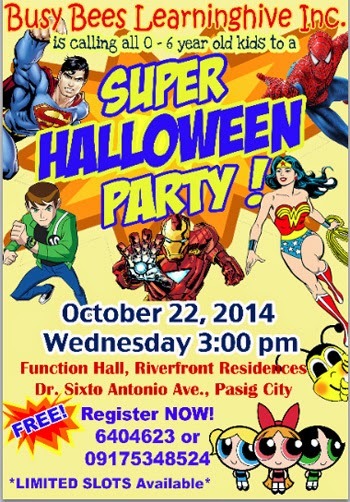 Activities: Games, Costume Contest, Trick or Treat, Face Painting and Photo Booth. 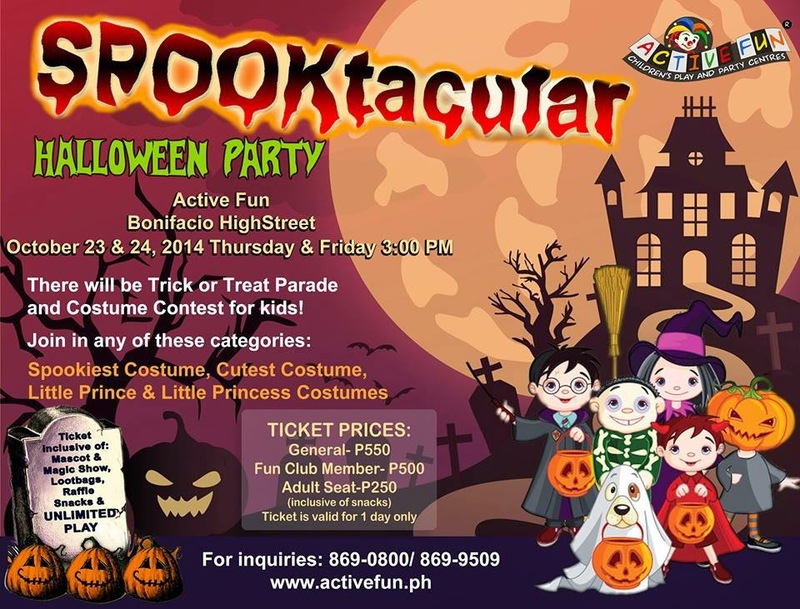 Ticket price: P150.00 for Funtasy Run, P250 for Funtasy Run+Trick or Treat package. For more info contact them at 570-0701 or visit their website. remember when preparing for this exciting event, don't forget to prioritize comfort and safety of our little ones. YEY! i've been waiting for this! Tsk. Why did Active Fun made it on a Thursday and Friday? 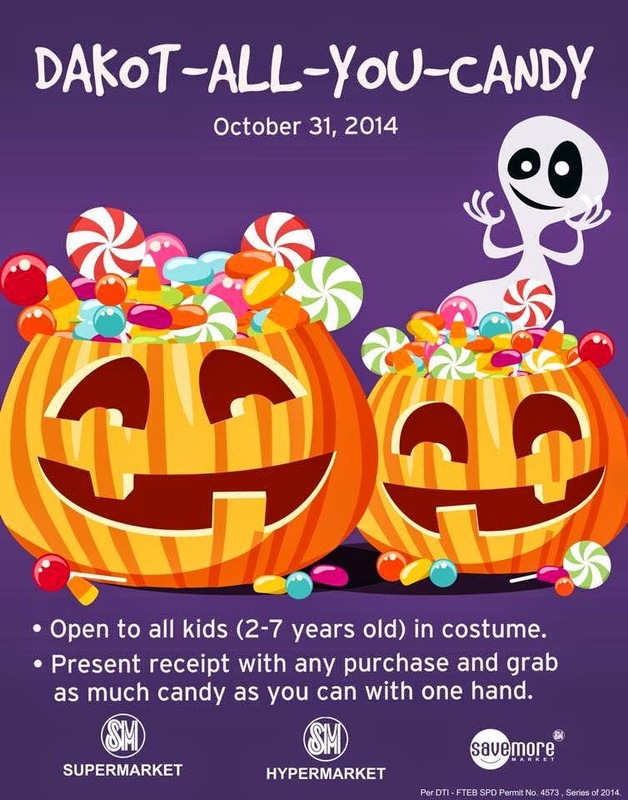 :( Any updates on Trick or Treat events at hotels? Thank you! Hello @valerie, already updated the list with some hotel halloween events. Thanks. pls post more choices! you are the best! 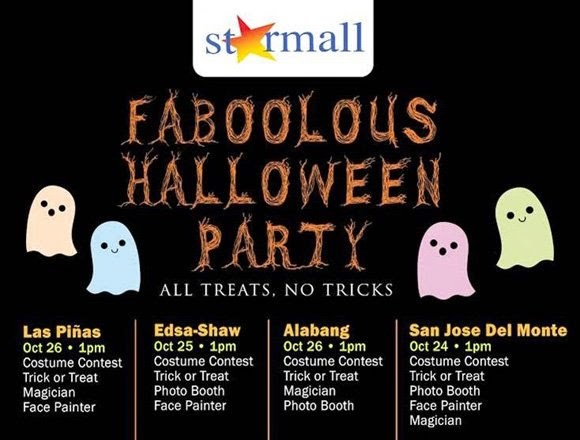 Trick or Treat event at SM Megamall?? Any update?? Thanks. Thanks for this!!!!! I have made my choices already! Podium doesn't have anything yet right? :) Thanks again! I used to have but the management of Manila Ocean Park asked me to take it down because of management's different direction this Halloween/October. Thanks. Kindly see updated post. Thanks! This is nice!! Not included here but, Bar One in Holiday inn will be featuring band and cocktail drinks on oct 31!! how bout sm megamall? Thanks! 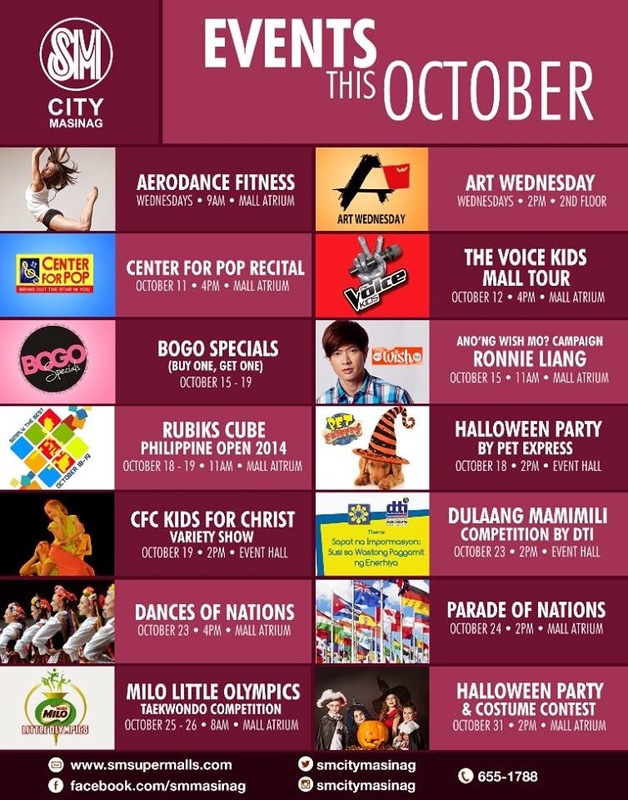 Is there a Halloween activity at the UP Town Center in Katipunan? Richmonde Hotel in EastWood also is not listed. For those kids who are not comfortable in busy places, I highly recommend their Halloween event this year. hello it's already listed @Melissa Bs! :) Thank you.